Intel has revealed details of its Z390 premium mainstream desktop chipset for motherboards. 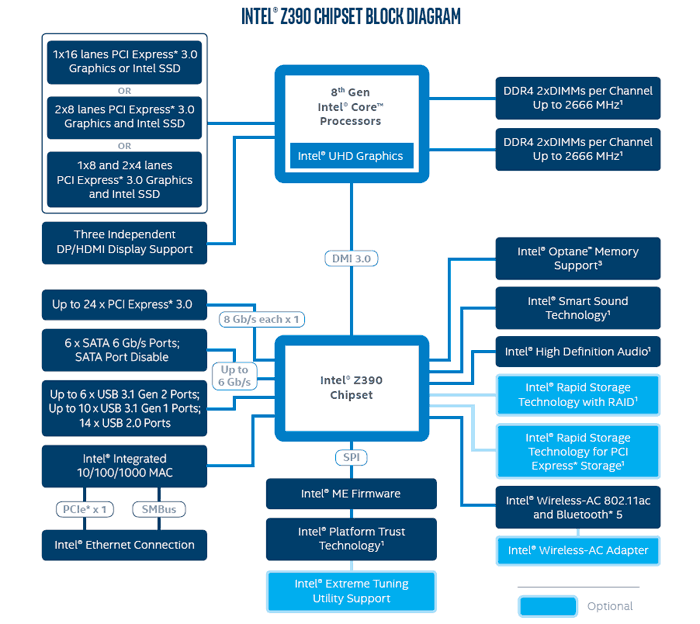 This Coffee Lake supporting 300-series chipset offers capabilities beyond Z370, as you would expect. The specific areas it improves upon in are; integrated connectivity (CNVi), Intel Smart Sound technology, and an improved networking feature-set. Starting with the basics, like other 300-Series chipsets you are going to equip this board with an LGA1151 processor. Like the Z370 it supports overclocking, 4 downstream PCI-Express gen 3.0 lanes, six SATA 6Gbps ports with AHCI and RAID support, up to three 32Gbps M.2/U.2 connectors, and Optane memory. Additional features start to appear when we look at integrated connectivity (CNVi). In terms of USB connectivity the Z390 can support six USB 3.1 Gen 2 (10Gbps) ports from the chipset, plus ten USB 3.1 Gen 1 (5Gbps) ports, and 14x USB 2.0 ports. The CNVi also includes built-in networking features. The chipset supports an integrated 1GbE MAC interface, plus Intel Wireless-AC 802.11ac and Bluetooth 5. 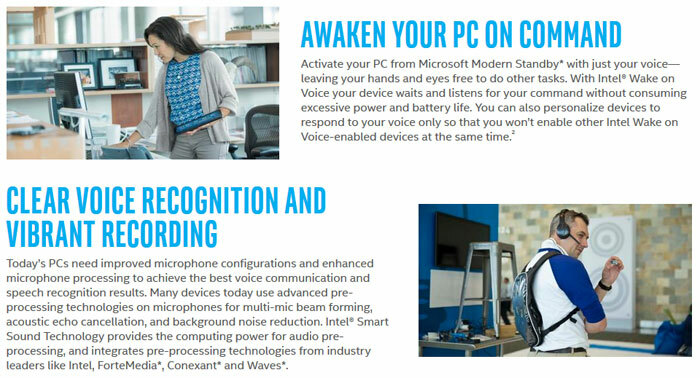 Intel Smart Sound technology uses a chipset DSP to offload audio/voice processing. It could be important in chipsets moving forward as people grow to like voice assistants like Amazon Echo and Google Home devices and expect their PCs to be able to work in a similar way. As well as such smart convenient features as Wake on Voice, the Intel Smart Sound tech is said to offer high fidelity recording and playback with very low power consumption. 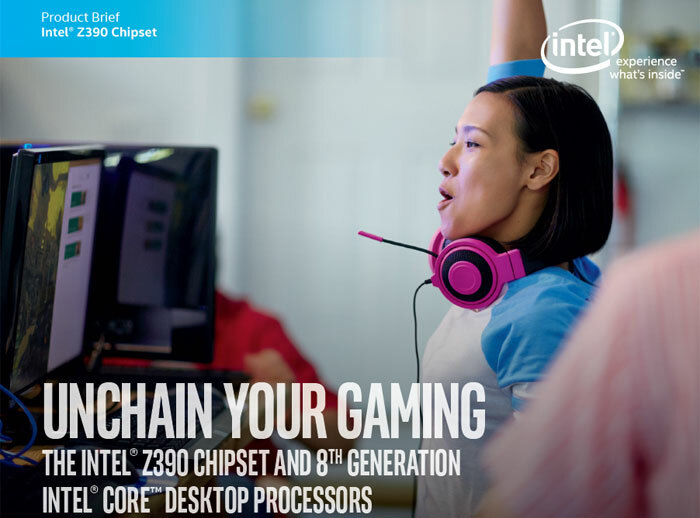 Within its official webpages and product brief PDF Intel doesn't mention any availability schedule for Z390 chipset motherboards. In a previously leaked roadmap it appears to be targeted for Q3 2018 release. And when are we possibly looking at the release of said chipset? SO there is a PCie lane that is connected to the chipset instead of directly to the CPU aint that a bottleneck? Depends on how many DMI lanes there are, I'm short on time so haven't looked it up but IIRC a single DMI 3 lane supports 8 gigatransfers per second so a bottleneck would depend on how many lanes there are and what you're putting through it, I'd probably be more worried about latency than transfer speeds though. I've seen Q3 2018 mentioned elsewhere on the interweb.